During Iron Man 3, one performer towered above all others, captivating audiences and gaining fans around the world. Of course, we're talking about the 15 foot tall stuffed bunny known as the Stark Bunny. While the Stark Bunny's screen time proved to be fleeting, his shocking death scene during the Mandarin's attack on Tony Stark's Malibu mansion had many fans in tears. Fortunately, with Marvel Studios movies, we've learned that characters can come back from the dead. 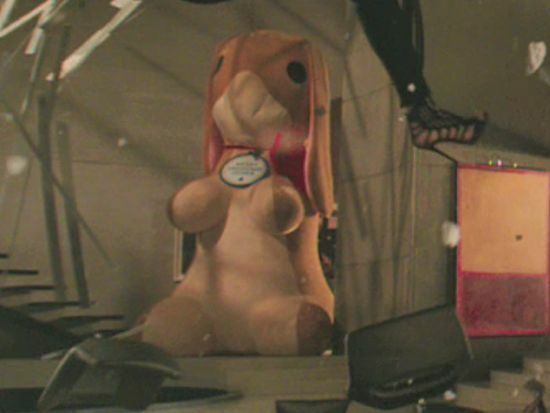 The Stark Bunny was actually created for Marvel Studios by a company called Gann Memorials. In an exclusive interview with Comicbook.com, Gann Memorials owner Chris Gann, talks about the secret origin of the Stark Bunny, clarifies rumors of onset squabbles, and addresses the possibility of the Stark Bunny returning. Comicbook.com: Can you give us a brief overview of the secret origin of the Stark Bunny? What material was used to make the Stark Bunny? How long did it take to make the Stark Bunny start to finish? Chris Gann: We used a super soft plush toy fabric for Stark Bunny's skin. The skin was crafted in China, but the stuffing and finishing work took place in our North Carolina factory. To give Stark Bunny stability, we also incorporated a internal skeleton. Altogether, it took about 8 weeks to produce and deliver. Comicbook.com: If someone wanted to buy an exact replica of the Stark Bunny, then how much would it cost? Do you currently have any Stark Bunnies in stock to sell or are they all custom made? Chris Gann: Due to Marvel Studio's character ownership, we are awaiting licensing approval to launch our own line of "Stark Bunny" toys. If any fans wish to preorder their own Stark Bunny toys, we are planning to release 1 and 6 foot versions. The actual movie Stark Bunny measured 15 feet, so if any diehard fans are interested in ordering this size, they can also contact us at: production@gannmemorials.com Once licensing approval is finalized, preorder interests will receive first priority. Comicbook.com: Marvel Studios is famous for requiring multi-picture deals for their actors. Did the Stark Bunny just sign on for Iron Man 3 or did he sign a multi-picture contract? Chris Gann: To the best of our knowledge, there are no current plans for Stark Bunny's return. Comicbook.com: Is there any chance we will see the Stark Bunny in The Avengers 2? Chris Gann: Again, to the best of our knowledge, there are no current plans for his return. Chris Gann: Ironically, we did produce two additional stunt Stark Bunnies. While we weren't present for all filmed scenes, we assume one was used for the initial mansion attack (seen in flames shortly thereafter) and the second one was seen floating to the ocean floor. Comicbook.com: Did you get the Stark Bunny back after shooting was finished? Or if not do you know his current whereabouts? Chris Gann: We are currently unaware of any of the three Stark Bunnies' whereabouts, nor did we receive them back. Comicbook.com: How do you rank the Stark Bunny's performance in comparison to other great stuffed animal performers like Ted, The Last Mimzy, or Keanu Reeves? Chris Gann: In my opinion, Stark Bunny gave an award winning performance, and held up quite well despite the extreme work environment. Comicbook.com: If Disney can't hammer out a deal to bring Robert Downey Jr. back for Iron Man 4, is there any chance we could see the Stark Bunny in the armor? Chris Gann: I am highly dubious of this possibility, but there is always that glimmer of hope. Comicbook.com: How did the Stark Bunny handle his star status? Was there any truth to the rumors of his onset squabbles with Ben Kingsley? Chris Gann: Throughout filming, Stark Bunny kept his ego in check, and there is absolutely no truth to the Ben Kingsley rumors. Comicbook.com: A lot of fans were disappointed that the Stark Bunny was played up like a central cast member in the trailers, but in a surprising twist he only had a couple scenes in the movie. Were there any other scenes with the Stark Bunny that didn't make the film? Chris Gann: I did not see the shooting script, so additional scenes may or may not have been shot. I guess we will have to wait for the Digital/Blu-Ray release. Comicbook.com: Is there any thing else that you would like to relay from the Stark Bunny to his many fans? Chris Gann: Stark Bunny appreciates all of his fans, and hopes to continue his acting career for years to come!